SAN JOSE, Calif.--(BUSINESS WIRE)--Cypress Semiconductor Corp. (NASDAQ: CY), the embedded solutions leader, today announced the availability of an automotive-qualified USB-C controller with USB Power Delivery (PD) that enables fast charging of portable electronics in vehicles. The Automotive EZ-PD™ CCG3PA controller delivers a plug-and-play user experience to automotive charging ports by providing support for the USB PD 3.0 standard with programmable power supply (PPS), Qualcomm’s Quick Charge (QC) 4.0 protocol, and legacy charging standards. As the standards continue to evolve, compliance and interoperability pose an ongoing challenge, but the programmable controller overcomes these issues with its firmware upgradeability. Additionally, the controller offers a high level of integration that minimizes bill-of-material cost and simplifies designs, replacing multiple discrete components. More information on the controller is available at www.cypress.com/AutoCCG3PA. Cypress will be demonstrating the Automotive EZ-PD CCG3PA controller reference designs with DC/DC buck-boost converters from Monolithic Power Systems at the Electronica trade show from November 13-16 in Munich, Germany in Cypress’ booth number 446 in Hall C5 of the Messe München. Cypress’ Automotive EZ-PD CCG3PA controller is AEC-Q100 certified for automotive-grade performance. The controller’s programmability enables load sharing between ports, cable compensation and output power throttling based on temperature and battery voltage. The one-chip solution minimizes bill-of-material costs for USB-C power source products by integrating error amplifiers for constant voltage, constant current and PPS applications, a 30 V regulator that allows direct operation from VBUS, VBUS short protection on configuration channel (CC) pins, gate drivers for high-voltage power FETs, a low side current sense amplifier, and dedicated hardware for legacy charger detection protocols plus system level electrostatic discharge (ESD) protection. Programmable overvoltage and overcurrent circuitry protects systems against power overloads and other faulty operating conditions. The controller also integrates an ARM® Cortex®-M0 and 64KB Flash with read-while-write function for firmware upgradeability. The Automotive EZ-PD CCG3PA controller is now sampling in a 24-pin QFN (16 mm2) package. The controller will be in production in the first quarter of 2019. Designers can get started with the CY4532 CCG3PA evaluation kit, which is now available for $149. More info on Cypress’ automotive USB-C and PD solutions is available at www.cypress.com/AutoUSB-C.
Cypress’ EZ-PD portfolio of USB-C controllers also includes CCG1, the world’s first programmable USB-C controller, CCG2, the market’s smallest programmable USB-C solution, CCG3, the market’s most integrated programmable USB-C solution, CCG4, the world’s first two-port USB-C solution, and CCG5, the market’s first two-port USB-C solution optimized for Thunderbolt notebook and desktop PCs. The EZ-PD portfolio was the first to support the latest USB PD 3.0 specification, which enables more robust end-to-end power delivery and charging solutions for laptop and mobile devices. The USB-C standard is gaining rapid support with top-tier electronics manufacturers by enabling slim industrial designs, easy-to-use connectors and cables, and the ability to transmit multiple protocols and deliver up to 100 Watts of power. The USB-C standard’s 2.4-mm-high connector plug is significantly smaller than the current 4.5-mm USB Standard-A connector. Cypress works with the world's top automotive companies to develop leading-edge automotive systems, including Advanced Driver Assistance Systems (ADAS), 3-D graphics displays, wireless connectivity, full-featured touchscreens and superior body electronics. Cypress’ automotive portfolio includes Traveo™ and PSoC® microcontrollers (MCUs), CapSense® capacitive-sensing solutions, TrueTouch® touchscreen solutions, Wi-Fi®, Bluetooth® and USB connectivity solutions, power-management ICs (PMICs), and NOR flash, F-RAM™ and SRAM memories. The portfolio is backed by Cypress' commitment to zero defects, excellent service and adherence to the most stringent automotive industry standards. Learn more at www.cypress.com/automotive. Cypress, the Cypress logo, PSoC and CapSense are registered trademarks and EZ-PD, Traveo and F-RAM are trademarks of Cypress Semiconductor Corp. All other trademarks are property of their owners. 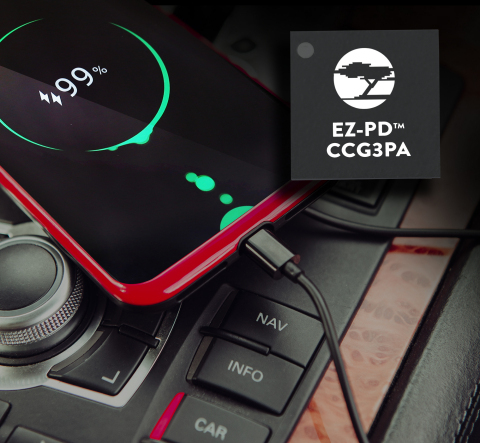 Cypress Semiconductor introduced the automotive-qualified EZ-PD CCG3PA controller that delivers fast charging of portable electronics via USB-C ports.